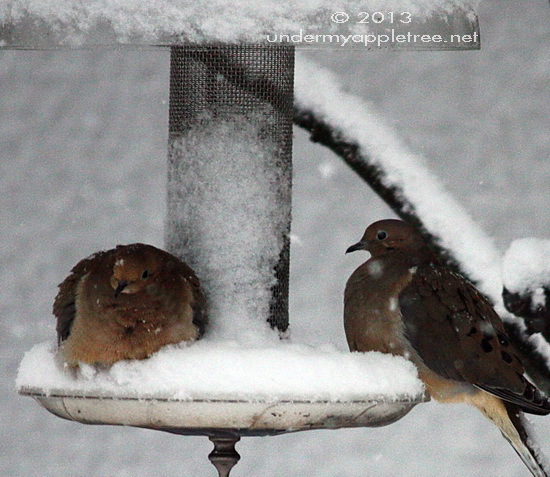 Almost wordless: This pair of doves sat in the finch feeder for hours. Although it’s filled with snow, it’s sheltered by the apple tree and garden shed. They finally left at dusk. Aw, poor babies – they needed a shelter from the storm. Oh what a pair! 🙂 Beautiful picture. How cute..I hope they were warn enough. So sweet:) The doves around here are all ground feeders, it seems. Awwww, poor little birdies. I often wonder how the ones we have here survive with their spindly legs when I’m freezing.